The panel is manufactured using CAD machines with mirror polished finishing on 3mm high quality brass. Then the panel is put under an electrochemical nickel treatment and finally PVD (Physical Vapour Deposition) is made over the panel to protect it against atmospheric agents. Titanium and Zirconium vapours are diffused at high temperature and under vacuum conditions over the panel in BRASS COLOUR PVD. Then BRASS buttons with BRASS COLOUR PVD treatment are mounted. Behind the panel two hinges are mounted for each nameplate. Also the supports for electronic (camera and loudspeaker) are mounted behind the panel. Finally LED for each nameplate are installed inside the embedding box. Many accessories are included like temporary nameplates, plastic to increase light diffusion and BRASS COLOUR PVD brass nameplate or black PVC plastic nameplate (on demand PT1810/309). Finally the panel is mounted on the embedding box and shipped jointly with burglar key. 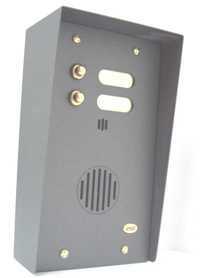 The panel is manufactured using CAD machines with brushed finishing on 3mm high quality brass. Then the panel is put under an electrochemical nickel treatment and finally PVD (Physical Vapour Deposition) is made over the panel to protect it against atmospheric agents. Titanium and Zirconium vapours are diffused at high temperature and under vacuum conditions over the panel in BRASS COLOUR PVD. Then BRASS buttons with BRASS COLOUR PVD treatment are mounted. Behind the panel two hinges are mounted for each nameplate. Also the supports for electronic (camera and loudspeaker) are mounted behind the panel. Finally LED for each nameplate are installed inside the embedding box. 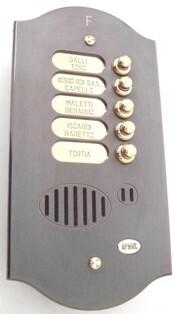 Many accessories are included like temporary nameplates, plastic to increase light diffusion and BRASS COLOUR PVD brass nameplate or black PVC plastic nameplate (on demand PT1810/309). Finally the panel is mounted on the embedding box and shipped jointly with burglar key. 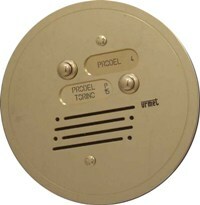 The panel is manufactured using CAD machines with brushed finishing on 3mm high quality brass. Then the panel is put under an electrochemical nickel treatment and finally PVD (Physical Vapour Deposition) is made over the panel to protect it against atmospheric agents. Titanium and Zirconium vapours are diffused at high temperature and under vacuum conditions over the panel in COPPER BRONZE COLOUR PVD. Then BRASS buttons with BRASS COLOUR PVD treatment are mounted. Behind the panel two hinges are mounted for each nameplate. Also the supports for electronic (camera and loudspeaker) are mounted behind the panel. Finally LED for each nameplate are installed inside the embedding box. Many accessories are included like temporary nameplates, plastic to increase light diffusion and BRASS COLOUR PVD brass nameplate or black PVC plastic nameplate (on demand PT1810/309). Finally the panel is mounted on the embedding box and shipped jointly with burglar key. 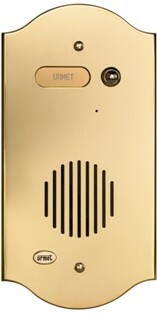 The panel is manufactured using CAD machines with brushed finishing on 3mm high quality brass. Then the panel is put under an electrochemical nickel treatment and finally PVD (Physical Vapour Deposition) is made over the panel to protect it against atmospheric agents. Titanium and Zirconium vapours are diffused at high temperature and under vacuum conditions over the panel in GUN METAL COLOUR. Then BRASS buttons with BRASS COLOUR PVD (or STEEL COLOUR PVD on demand) treatment are mounted. Behind the panel two hinges are mounted for each nameplate. Also the supports for electronic (camera and loudspeaker) are mounted behind the panel. Finally LED for each nameplate are installed inside the embedding box. Many accessories are included like temporary nameplates, plastic to increase light diffusion and BRASS COLOUR PVD brass nameplate or black PVC plastic nameplate (on demand PT1810/309, or STEEL COLOUR PVD on demand). Finally the panel is mounted on the embedding box and shipped jointly with burglar key. 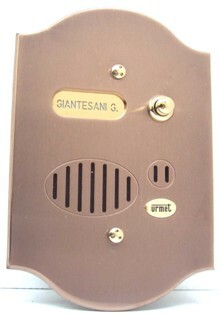 The panel is manufactured using CAD machines with polished finishing on 3mm high quality brass. Then the panel is put under an electrochemical nickel treatment and finally PVD (Physical Vapour Deposition) is made over the panel to protect it against atmospheric agents. Titanium and Zirconium vapours are diffused at high temperature and under vacuum conditions over the panel in STEEL COLOUR. 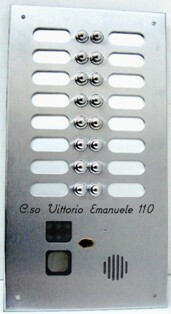 Then STEEL buttons with BRASS COLOUR PVD (or BRASS COLOUR PVD on demand) treatment are mounted. Behind the panel two hinges are mounted for each nameplate. Also the supports for electronic (camera and loudspeaker) are mounted behind the panel. Finally LED for each nameplate are installed inside the embedding box. Many accessories are included like temporary nameplates, plastic to increase light diffusion and STEEL COLOUR PVD brass nameplate or black PVC plastic nameplate (on demand PT1810/309, or BRASS COLOUR PVD on demand). Finally the panel is mounted on the embedding box and shipped jointly with burglar key. 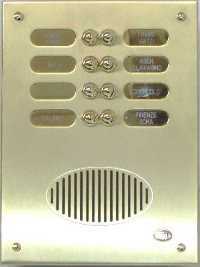 The panel is manufactured using CAD machines with brushed finishing on 3mm high quality brass. Then the panel is put under an electrochemical nickel treatment and finally PVD (Physical Vapour Deposition) is made over the panel to protect it against atmospheric agents. Titanium and Zirconium vapours are diffused at high temperature and under vacuum conditions over the panel in STEEL COLOUR. Then STEEL buttons with BRASS COLOUR PVD (or BRASS COLOUR PVD on demand) treatment are mounted. Behind the panel two hinges are mounted for each nameplate. Also the supports for electronic (camera and loudspeaker) are mounted behind the panel. Finally LED for each nameplate are installed inside the embedding box. Many accessories are included like temporary nameplates, plastic to increase light diffusion and STEEL COLOUR PVD brass nameplate or black PVC plastic nameplate (on demand PT1810/309, or BRASS COLOUR PVD on demand). Finally the panel is mounted on the embedding box and shipped jointly with burglar key. The panel is manufactured using CAD machines with mirror polished finishing obtaining the NATURAL BRASS effect on 3mm high quality brass. Then NATURAL BRASS buttons are mounted. Behind the panel two hinges are mounted for each nameplate. Also the supports for electronic (camera and loudspeaker) are mounted behind the panel. Finally LED for each nameplate are installed inside the embedding box. Many accessories are included like temporary nameplates, plastic to increase light diffusion and NATURAL BRASS nameplate or black PVC plastic nameplate (on demand PT1810/309). Finally the panel is mounted on the embedding box and shipped jointly with burglar key. 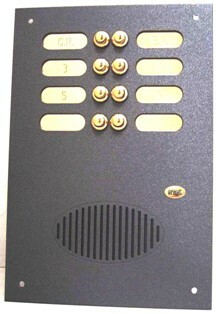 The panel is manufactured using CAD machines and painted to obtain the OLD IRON effect on 3mm high quality brass. Then the panel is put under special painting to protect it against atmospheric agents. 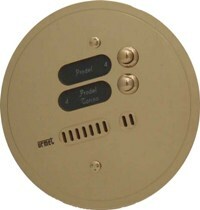 Then BRASS buttons with BRASS COLOUR PVD (or STEEL COLOUR PVD on demand) treatment are mounted. Behind the panel two hinges are mounted for each nameplate. Also the supports for electronic (camera and loudspeaker) are mounted behind the panel. Finally LED for each nameplate are installed inside the embedding box. Many accessories are included like temporary nameplates, plastic to increase light diffusion and BRASS COLOUR PVD brass nameplate or black PVC plastic nameplate (on demand PT1810/309, or STEEL COLOUR PVD on demand). Finally the panel is mounted on the embedding box and shipped jointly with burglar key.